There are different ways to handle NULL’s and I wrote about one such way in my last post. In this post, we look at SQL ISNULL() and specifically at the SQL Server version. MySQL does have this function but it behaves a little differently as it returns a boolean value. check_expression – this is the expression to be checked. This can be any data type. replacement_value – this is the value to replace the NULL with. This can also be a field. The data type returned depends on what check_expression data type is. Pass in a varchar field here and a varchar will be returned. A varchar will be returned by ISNULL() here even if replacement_value has an integer value passed in. However, there are exceptions as the replacement_value has to be of a data type that can be implicitly converted to the same data type as check_expression. 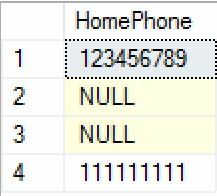 So this is the data with some NULL’s in rows 2 and 3. Now we will apply ISNULL() to return a hyphen in place of the NULL. If we now pass in an integer as replacement_value, the code will still work fine because the integer can be implicitly converted to a varchar. So this works fine. Personally if I were writing this code, I would implicitly convert it within the SQL. In my opinion, this reads better because it’s clear what the data type returned is. I would write it in the same way if replacement_value was a field for the same reason. You are looking to find a way to find the first non-null value from a list of fields. In this post, we look at SQL COALESCE – a wonderfully useful tool that helps to solve that problem. To help demonstrate this, we will talk about a hypothetical scenario where a number of customer leads have been added to a table from different sources and the consistency of data found in some of the key fields is sparse. 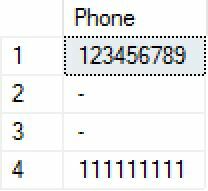 For the purposes of this example, the task is to pull out a single column list of phone numbers for the leads in the table and that involves finding the first non-null value. 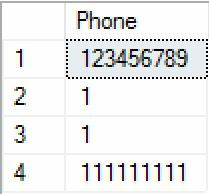 You can see that it has taken the first phone number (non-null value) found based on the order of columns passed into COALESCE. Sometimes, there is a requirement to make a backup of a table in MySQL. For instance, there could be a data update planned, schema change needed or that it is necessary to work with a copy of a table, perhaps for some report. A possible approach to this is to run a full backup of the database to call upon if something goes wrong. This is feasible but sometimes not practical. The database dump could take some time to complete and if something goes wrong and you need to restore, restoring the dump could equally take some time to complete. In this post, I will show a couple of ways to take backups of tables in MySQL. 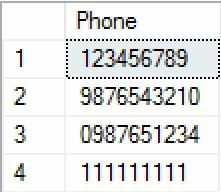 This method creates the structure of the table including indexes and then loading the data in via one statement. The advantages of this method are that makes a backup of the table immediately available with the database. It is however to all extents and purposes just like any other SQL statement by way of consuming disk space on the data drive. So disk space should be a consideration when performing this method. Instead of backing up the entire database, a backup of the table can be made using mysqldump. This is my personal preference if the requirement is just that a backup is needed and that there is no requirement to have the table online like in the first example. The backup is taken using mysqldump and can be directed to a location of choice. Disk space is therefore not a consideration for the data drive, rather it is necessary just for the location being backed up to. Configuring multiple tempdb files is not a new feature in SQL Server and has been a best practice for sometime to help ease and prevent tempdb contention which helps to increase the scalability of your SQL Server installation. 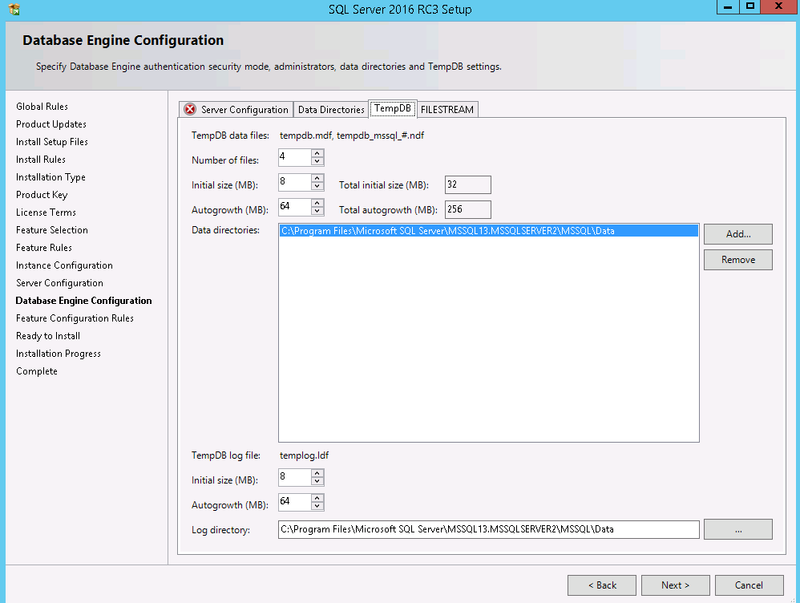 Before SQL Server 2016, this was a task which needed to be carried out after the installation but one of the new features of SQL Server 2016 is the ability to configure this as part of the install process. As you step through the installation and get to the point of Database Engine Configuration, there is a tab for tempdb where the configuration can be done.